A Gaslamp Fantasy with Adventure, Romance, and Mad Science! 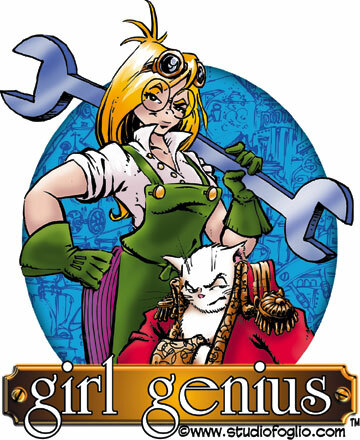 Steve Jackson Games is delighted to announce the Girl Genius RPG, set in the world created by Phil and Kaja Foglio in their Girl Genius comics and graphic novels. Written by Kaja Foglio, and illustrated by Phil and Kaja Foglio, the Girl Genius RPG will be a complete, self-contained gamebook using the Fourth Edition GURPS rules. It will include complete information on the steampunk world of Transylvania Polygnostic, rules for creating "Sparks," Jägermonsters, and other unique character types . . . and, of course, Sparky technology (clanks! giant clanks! giant clanks with guns!) and bio-tech (MONSTERS!). Like other Fourth Edition GURPS books, this will be a hardcover with full-color illustration throughout. Adventure with Agatha Heterodyne and her motley crew . 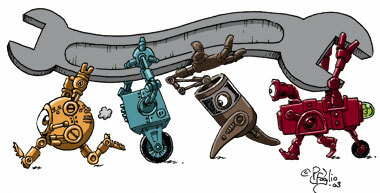 . . or create your own heroic Sparks to deal with the wonders and menaces of a world ruled by Mad Science! If you haven't yet discovered Girl Genius, visit www.girlgeniusonline.com, updated every Monday, Wednesday, and Friday, and join the fun. And yes, we do carry the graphic novels in Warehouse 23! Exact page count and price remain to be determined. The release date has not been set.